The gloves are off. Walmart, the world’s biggest ‘brick-and-mortar’ retailer, is coming for Amazon, the undisputed king of e-commerce. After acquiring a number of high-profile online retailers of late – most notably Jet.com in the US last year – Walmart has been adding hundreds more third-party sellers to their marketplace, Walmart.com, which is now home to an inventory of over 50 million individual products. Just over twelve months ago, their inventory had only 10 million. Earlier this year, for Q1 2017, Walmart reported its 11th straight quarter of growth, including online sales growth of an astonishing 63% YoY, helped by these acquisitions. As far as the numbers are concerned, however, Amazon is far from panicking. With expansive acquisitions of their own, their online sales for the same period reached a massive $35.71 billion, up 22.6% on the same period last year. Underlining its e-commerce dominance, in 2016 a staggering 43% of all online sales in the US went through Amazon, which could be the reason CEO and founder Jeff Bezos has been seemingly on top of the world. Despite its dominant position in the market, Amazon seems to be fortifying itself in unexpected ways. It’s recent acquisition of physical retail food chain Whole Foods – for $13.7 billion – is hefty evidence of a plan to take on new competition. After all, let’s not forget that food still accounts for approximately half of Walmart’s revenue. It’s led experts to ask the question: does Amazon want to become Walmart before Walmart becomes Amazon? Whatever the answer, this is already a famous case study for anyone with an interest in e-commerce, and a fascinating battle between two huge brands. In this article, we take a look at how both engage the key player – YOU – via their extremely valuable affiliate marketing and fulfillment programs. Both are key battlegrounds in terms of overall sales, online traffic, and brand reputation. 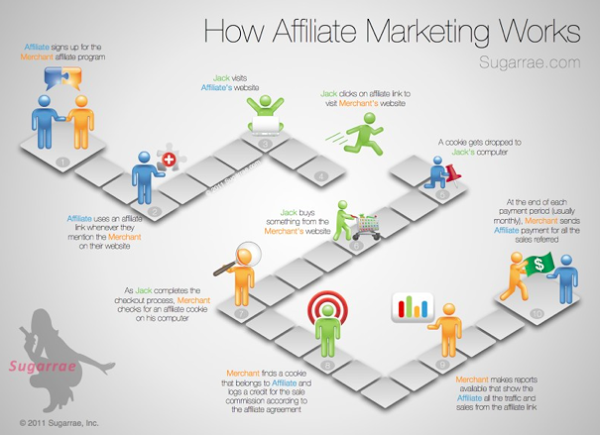 For those new to the game, take a minute to understand what affiliate marketing is. Essentially, it’s a performance-based online referral system, whereby a business (Amazon or Walmart for example) rewards one or more affiliates (otherwise known as “publishers”) for bringing customers to its site via their own online assets, paying commissions once customers make a qualifying purchase. Being an affiliate is definitely about what you can earn, be it a lucrative sideline or a full-time commitment. With claims that its affiliate program has been responsible for up to 40% of its revenue in the past, Amazon.com has been a lucrative source of income for bloggers and website owners for years, with earnings peaking in the last five years. The question now becomes, can Walmart do the same? With fees completely at the discretion of the retailer, things can change in a minute, as they did earlier this year when Amazon decided to restructure its affiliate commissions. In March, they introduced a category based commission structure, rather than rewarding by volume, which means it doesn’t matter if you sell one item or 1 million, you will still get the same rate. This had a mixed impact on Amazon affiliates, rewarding those selling high-value categories at low volume. Those who had a high volume of sales in the lower categories, however, will have seen a drop in their income. 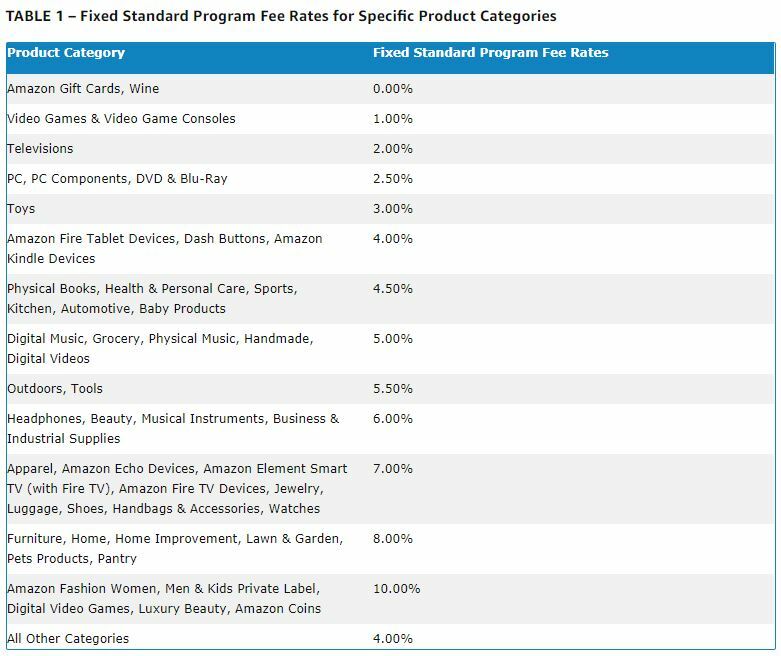 Check out this chart outlining what Amazon calls its Fixed Standard Fee Rates. 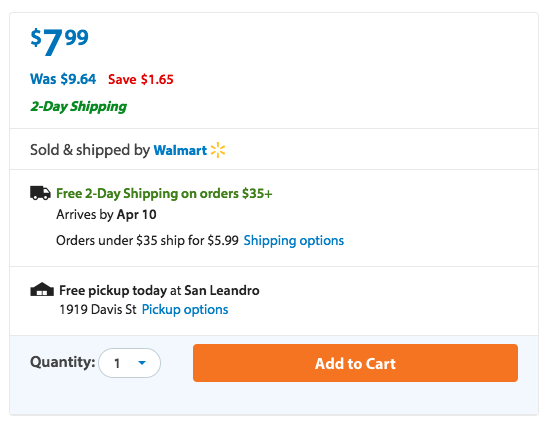 Side by side with Walmart’s own fee structure, we can see that they are competitive, with both brands offering higher rates on high-value products. Working critically in Amazon’s favor is their loyalty club, Amazon Prime, which is well established among consumers, and used frequently as an affiliate incentive. A 2016 study by Rakuten Marketing predicted that US affiliate marketing revenue would increase by a rate of 10.1 percent between 2015 and 2020 annually, growing into an industry worth an estimated $6.8 billion. As a result of these numbers, a myriad of agencies who can provide a marketplace to connect brands with affiliate marketers who promote products to earn revenue have popped up. This has helped giants like Amazon and Walmart to grow their affiliate program quickly, therefore generating more revenue for their businesses. If you have your own online business, you should know that you can sign up to an affiliate marketing service to act as an advertiser for you. Anybody with an online presence who meets your criteria can sign up as an affiliate marketer. Your criteria might be as simple as having a unique domain name; it’s entirely up to you. Once approved, affiliate marketers can find the details of your products and promote them on their own sites and social channels via trackable links. When their readers click through and purchase your product, you get the sale, the affiliate marketer gets a commission, and, depending on the network service or platform you choose, they may also take a small fee per purchase. Most affiliate programs offer commissions to their publishers per sale, also known as cost per sale, or CPS. However, some support pay per action models, or CPAs. These are payments made to the publisher each time a user completes a specific, pre-defined action. This may include signing up for a newsletter, entering an email to receive content, or signing up for a free trial. Cost per click, or CPC, means you pay a fee every time a user clicks on a publisher’s link to your business or products. Another fee structure might be a cost per 1,000 impressions, or CPM, which means you’re essentially paying for ad views. Each time the page on which the publisher has placed your link loads counts as one impression. The best affiliate programs support multiple ad types to give you the maximum possible reach. Product links can include straight text links, image links, or a combination of the two. These links contain the URL to your product along with all the pertinent tracking (cookie) data. Now let’s have a look at how Amazon and Walmart are getting it done. Both Amazon and Walmart do a great job supporting their affiliate programs via the “Amazon Associates” and “Walmart Affiliate Link” members areas, respectively. They both contain pertinent support information and updates relevant to fees, legalities, and opportunities for further monetization. While neither program offers volume-based commission, there is no cap on how much you can earn. This can make for a lucrative source of income, particularly in the high-value categories. Both brands realize that deep-linked affiliate campaigns yield higher conversion rates. That’s why they both offer affiliates a way to link to any page within their websites via an affiliate or tracked link. From standard banners to text links (which direct to the best-performing sections of their websites), and on to widgets and product feeds, both companies offer affiliates a wide array of creative material to work with. To keep their affiliates up-to-date and incentivized, both send between 7 and 10 affiliate newsletters per month. Realizing that content-producers (bloggers specifically) are among the most coveted types of affiliates, Walmart.com put together a WordPress plugin to help automatically convert relevant text to affiliate links. Who else is more capable of turning an affiliate program around than a web-developer? Both Amazon and Walmart realize this and equip them with Amazon Product Advertising APIs and the Walmart Open API Developer Portal. Both Amazon and Walmart are big on CRO, with the former often running hundreds of tests simultaneously, contributing to affiliates’ conversion rates of up to 17.6%. Walmart and Amazon both make it easy for their affiliates to activate by offering educational resources, motivating incentives, tools that equip, and ongoing support. Getting started is pretty simple for anyone with enough motivation. Much can be learned from both of these brands in how they treat holidays. Both equip their affiliates with everything they need to know to market their products effectively during key holidays throughout the year. Average Commission Rate: Varies, from 0% for gift cards to 10% for Amazon Coins, luxury beauty products – note the structure published earlier in the post. The switch from the volume based model to categories, as we mentioned earlier, sent ripples across the affiliate community. Here at FE International, we have created an Amazon Commission Calculator to help you work out how these changes affect you. Many have already been impacted by the changes; in particular, established affiliates who may have become too reliant on the success of Amazon Associates. Online marketers with more diversified income streams will not have been as heavily affected. In short, the model remains the same. Affiliate publishers who take part in the Amazon Associates and/or the Walmart Affiliate Link programs earn revenue by promoting any product they find on Amazon.com or Walmart.com on their own site. Both track links from most publishing models, but Amazon prohibits any affiliate publisher from using paid search or PPC campaigns. In both programs, affiliates can take advantage of a wide range of ads, including mobile popovers, widgets, banners and text and image links. 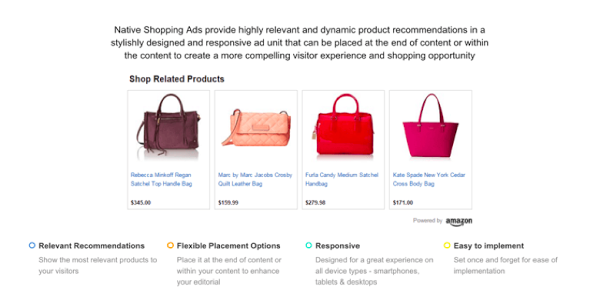 Amazon also offers so-called “Native Shopping” ads that self-populate based on the content on the page or via a pre-determined search term. CloudLiving gives us this example of a website running a wildly successful Amazon affiliate program: thewirecutter.com. 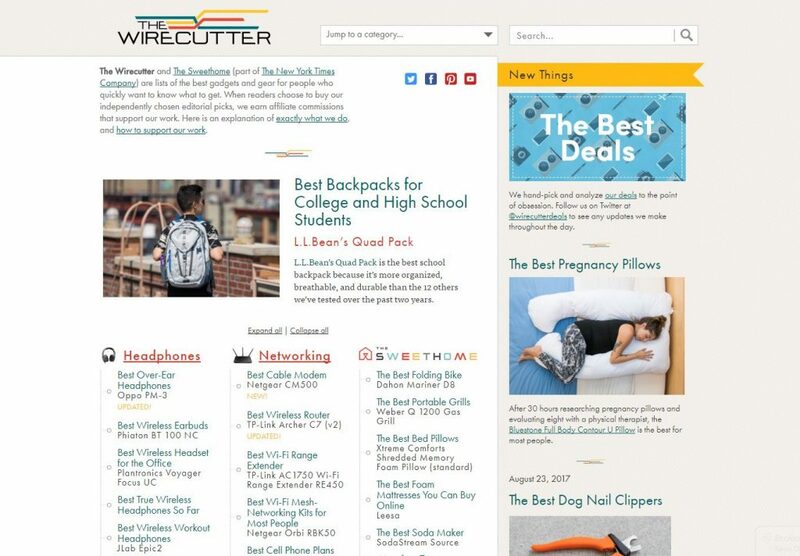 Founded in 2011 by the former Editorial Director of Gizmodo Brian Lam, The Wirecutter focuses on intensive testing and review of products across a wide range of categories. Based on its success generating income purely from affiliate sales of Amazon products, the site was acquired by The New York Times for $30 million five years later in 2016. Amazon does a great job of encouraging additional purchases once people are browsing. Even if they don’t purchase the product they originally clicked on, affiliates earn commission on any other supplementary product bought. They also allow plugins that enable links to be “add to cart links,” meaning if anyone adds a product listed on your site to their cart and goes through with the purchase outside of the 24 hour cookie period, you’ll still earn a commission as long as the purchase goes through within 90 days. It’s easy to set up and get running. It takes minutes to set up an account, and there isn’t a particularly stringent vetting process. Because Amazon is big enough, they don’t have to worry too much about having multiple low volume publishers. Earn commissions on products you didn’t sell. This is undoubtedly the best part of Amazon’s affiliate offer. In other programs, if a shopper clicks your link for one product but goes on to buy something else, you get nothing. With Amazon, anything the user buys when they reach the site after you refer them will earn you a commission. You could refer them to a $10 book and if they remember they wanted to buy a $1,000 TV; you get the commission on the TV as well. It has a lot of tools, features, and reports. They’ve been doing this for a long time, so the amount of data at their disposal is huge. They also have a number of intuitive tools to make life easier for newcomers. Amazon is one of the biggest and most trusted brands in the world. If you’re the first in any industry to make it big, you get what’s known as brand saliency, which Amazon certainly has. They operate with integrity and have, for the most part, proven that they can be trusted to do what they say they will. They also honor price-matching, practice a rigorous return policy and promote deals that keep their site front of mind for anyone who goes online to buy anything. Amazon sales can dramatically increase conversions. Amazon does sales. From regular repeated sales to pre-order bonuses and seasonal extravaganzas. As an affiliate marketer, you wouldn’t normally be able to take advantage of sales, or might even find them harmful. With Amazon, the sales are so good they can’t help but benefit your site. Amazon’s product range is huge. 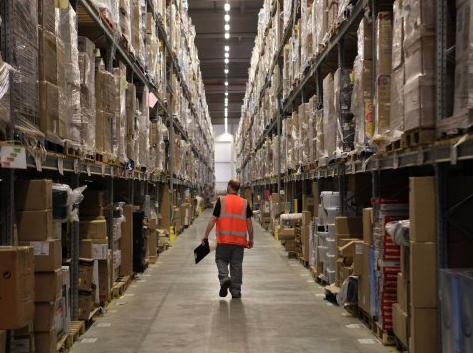 At any given time there are upwards of 250 million items available to buy on Amazon. That’s an insane number, considering you can make a commission off most of them. Need we say more? To make it work for you, you need to achieve volume. Both in percentage and raw value, one sale won’t make you rich, so this is generally the most common complaint we hear from Amazon Affiliate members. The affiliate cookie is only 24 hours. Time really is money at Amazon. If the user decides not to make a purchase within 24 hours of clicking your trackable link, you get nothing because the cookie code has already expired. On big ticket items like TV’s and refrigerators, this is very common. Additionally, if they don’t trust your site, they may simply exit the browsing session and go to Amazon directly, which also means you miss out. There’s a lot of competition for the best niches. Despite hundreds of millions of available products, there aren’t always that many products selling regularly. If there’s not much demand, you won’t make much from affiliate sales, especially when the high volume, high-value niches already have established competition. You might not be eligible for the program. Or worse, you may have been a non-compliant affiliate and been banned. If you can’t access the program, you can’t use it to make money. You need an alternative. As we said, Walmart is gearing up to take on THE top dog of e-commerce. Currently stocking over 50 million SKU’s and rising online (consider that the average Walmart store has about 150,000) Amazon has been stocking well in advance of 200 million for years, which means that at the moment, comparisons between the two are still apples to oranges. 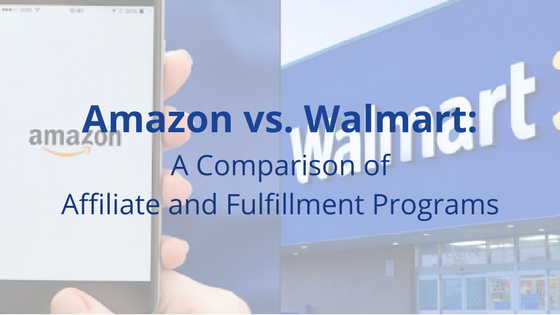 Some would even argue that given the fact you can check Walmart’s products online and then go to a store to purchase makes it crazy to compare the two in terms of their affiliate programs. But, given that they are now operating in a very similar space, their affiliate program is also very similar to Amazon’s, even if Walmart does outsource its operation to LinkShare (now known as Rakuten, who claim to be the largest pay-for-performance affiliate marketing network on the internet). For those working with Amazon already, there are several reasons website owners might want to try Walmart’s affiliate program. The first is that in the US, Amazon blocks certain states from becoming affiliates. That’s right, if you live in Arkansas, Colorado or Maine, because of a sales tax dispute, you simply can’t sign up to be an Amazon affiliate. Because of Amazon’s incredible reach – it has some 400 distribution (fulfillment) centers of various specialty all over the world – Walmart has so far found it difficult not only to match their volume of products but also their promise on delivery. An Amazon Prime membership promises free, 2-day shipping on over 50 million eligible items at a cost of $10.99 per month. So far, even with Walmart’s promise of free, 2 day delivery on any order $35 or over (no memberships required) the anecdotal evidence online hasn’t been strong. Basically, they’re not getting it done. Also working against Walmart is the fact that despite a cookie length of 3 days compared to Amazon’s 24 hours, its commissions on products are generally lower, making their program less attractive than the industry leader. In addition, a payment threshold of $50 compared to Amazon’s $10 sets up one more barrier to entry, especially if you’re new to the affiliate game. With Walmart positioning itself as offering the lowest prices due to its huge buying power – their tagline is “Save Money. Live Better” (which replaced its famous “Always Low Prices. Always” about ten years ago) – building up that first $50 might take quite some time, which is demotivating. 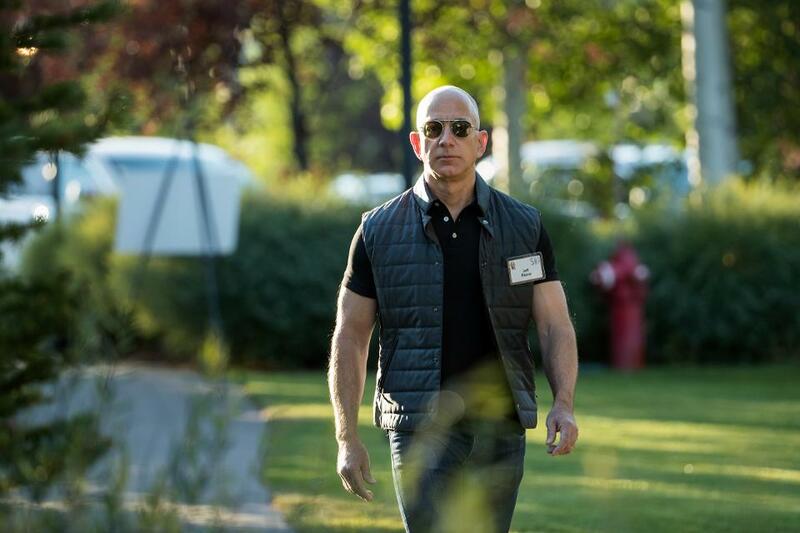 On the flip side, Amazon has built themselves a reputation of being tough taskmasters. Violate their rules once, which change frequently, and you could be struck off their affiliate list forever. Fundamentally, however, despite impressive growth figures (albeit from a much smaller base), you’d have to think at this point, it isn’t quite yet in people’s mindsets to consider Walmart as an online retailer, or at least to have them top of mind. As Walmart’s recent partnership with Google demonstrates, we’re sure they will work to change that. Right now, however, shoppers know that while browsing, they can likely find the item at a cheaper price at their nearest physical Walmart–of which there are over 4,000 in the US, a clear case of their status as the biggest brick-and-mortar retailer in the world working against them online. With years of experience upselling and cross-selling, Amazon is the undisputed champion of getting online shoppers to buy more than what they might have originally intended; meaning a far better outcome for affiliates, especially when they earn revenue on all items purchased via their link, not just the specific product. Despite a much longer cookie life (3 days compared to 24 hours) research tells us that 85% of purchases are made on the first day. They currently DO NOT ship outside the US. Walmart carries a lot more ‘zero commission’ products. Products that affiliates make NO revenue from. Fulfillment is the opportunity for third-party sellers to have companies like Walmart and Amazon list their products in their marketplace, and for a fee and a cut of the sale, take care of the storage, packing, and shipment of their products. This sounds simple, and it is. It’s a model that thousands of e-commerce business owners take advantage of, as it avoids having to store physical items, and employ people to fulfill orders as they expand. If your business is still in flux, you might be wary of promising someone a job. Instead, by using a third party fulfillment model, you can outsource the work to a logistics company and let them be responsible for the finding and hiring of good people. In this way fulfillment by either Walmart or Amazon lets you concentrate on what you’re good at. Hopefully, this involves finding new products that people want and executing a strategy to convert visitors. In this area, Walmart may not be as optimized as Amazon Prime’s 2-day delivery promise, but we expect it will improve. As of June 2017, it was doing everything it could to match Amazon, scrapping the old “ShippingPass” membership, testing an app-based employee delivery service, and offering pick-up discounts on up to 1 million of its online-only products. Its long history of this practice puts Amazon at an advantage, but it needs to ensure it holds its place as leader. Walmart’s huge distribution network will ensure it will take market share, but how much remains to be seen. For third-party sellers, the barrier to entry might be higher, but this means the competition is reduced compared to Amazon, something which might suit many. Becoming a Walmart selected seller is a lot more stringent than Amazon. Walmart prefers to select third-party sellers based on sales projections, reputation, and alignment with their values. Your sales records, order defect rate, return policy, customer support, and seller ratings on other online marketplaces are all taken into consideration. 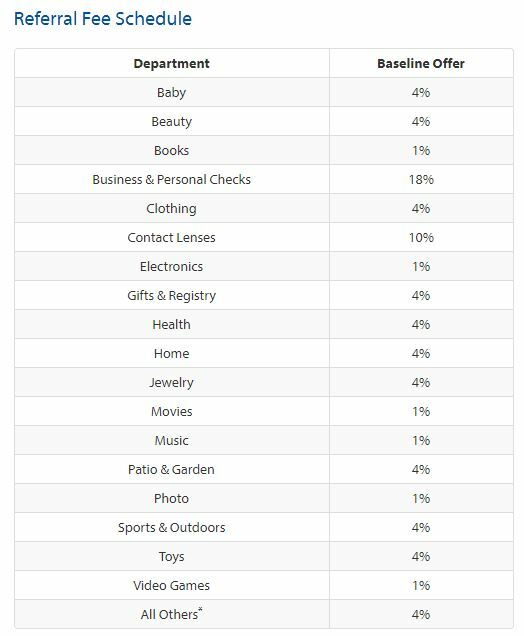 Walmart favors brand owners over retailers, so if you have products to sell that carry your brand name, Walmart will give you preference over other sellers. If you are a general merchant, you will gain bonus points by assuring the lowest price for your offerings. Anyone considering a partnership with Walmart should look at their stock distribution, then request an invite. You may have to queue for 2-4 weeks before Walmart inducts you. Amazon is open to just about everyone, however, it costs $39.99 a month to sell through them. Both Walmart and Amazon take a commission on sales that goes up to 15% for some categories. As on Amazon, item descriptions play an essential role in helping prospects find your products via related keywords or phrases in search engines. SEO will play an important role because the higher your listing is ranked, the more likely prospects are going to come across it. For this reason, your item descriptions should include important keywords, but use a tone that people can relate to. In addition, you should add several high-quality images of the product; people prefer to view items from multiple angles. Mention the brand, item name, and keywords describing the product’s USP. Also, include related phrases customers may search for. Don’t be afraid to include facts and tips. This will increase credibility. Walmart recommends searching relevant attributes and including them to help users find your items on the Walmart marketplace. Price is one of the factors impacting your ranking on Walmart’s marketplace. Ensure that your landed price – i.e. item value + shipping – is competitive. You’ll be able to see what’s known as “Buy Box” prices when you preview items, which you can adjust accordingly. The “buy box” is something Amazon has pioneered for sellers. Being featured in or “winning” the buy box via a complex algorithm determines which seller’s product gets the prime location on the page – in the “add to cart” box. Amazon themselves admit that around 82% of sales happen through the buy box. Walmart invites customers to rate and review the items they buy from its marketplace. Positive reviews with a picture or video of your item will do wonders for your ranking. If you know buyers who have enjoyed your item, encourage them to rate and review. Also, proactively monitor the average rating of your seller profile. If you see negative comments from buyers, reach out to them to address their concerns quickly. Unit cancellation indicates what percentage of sold units have been canceled. The sale cancellation metric specifies what percentage of overall sales have been canceled. More than 1.5 percent shows that there is room to improve your inventory. A lot of sellers have concerns about the time, cost and effort needed to learn how to market on Facebook. In reality, it’s a straightforward process and the ROI can be immense. Simply setup a Facebook business page and start creating ads in the site’s back-end. Influencer marketing is about utilizing the authority of bloggers and social media personalities to drive traffic to your product pages. For instance, if you’re selling cosmetics on Walmart.com, you might want to collaborate with influencers from the “makeup & beauty” niche. Send your influencers a few samples to review and inform them that you want your items’ links to go up in the caption/blog post they make. Walmart’s ambitious approach has spawned new opportunities for affiliates to make some additional income, and Amazon’s changes to the fee structure in March has certainly made the two platforms competitive. An obvious difference is how hard it is to become a Walmart third-party seller. It’s invite-only and can take 2-4 weeks before your application is approved. You also need to have a good history of selling on other marketplaces. Amazon, on the other hand, allows anyone to create a seller profile, with merchants paying $39.99 a month to have a presence. Walmart is free. Another key difference is that Walmart has a much smaller inventory of products. Despite adding millions each month, it’s still small compared to Amazon’s 260 million and counting. Fewer products combined with an invite-only rule does mean there is less competition on Walmart, however, if you are accepted, you do have an opportunity to stand out. Amazon has more than 2 million third-party sellers, so it’s much more difficult to differentiate. As a whole, Amazon will continue to be more competitive in the years to come but Walmart is set to be a strong number 2 in the US, and will offer more lucrative revenue streams in certain niches. What is my market? Which category should I focus on? Do I have enough traffic to generate revenue? If not, how do I increase traffic to my blog/website? How much competition is there for my niche? Do I have a budget for online advertising and SEO to drive traffic to my site? The answers to these questions should help you decide which platform to go with but it is important to identify the sort of products visitors to your sites will want to buy as a first step. The bottom line is there are still opportunities to generate a sizable income from both affiliate programs. They share the same commission structures and sell broadly similar products. Find out where they are different, looking into the facts and figures. As with any business, those who understand the processes required to drive revenue will succeed. It is also about identifying your niche. So if you have a blog or website about makeup, chances are you will generate more revenue promoting luxury beauty products on Amazon than business or personal checks on Walmart. Do your research, drive traffic to your sites and ensure you are promoting the products relevant to your audience. With a clear, well-designed advert on your site, you should start seeing revenue streaming in.